Every wondered what the numbers refer to at the side of occupations when using the 1911 census? This entry was posted in General on March 19, 2017 by carol. Recently I collected another print run of my Family History Diary and I was delighted with the new section I asked them to included. What is a Family History Diary? An A4 40-page booklet printed on quality 120gsm paper offering a simple and easy way to organise your research. It is a handy and easily transportable way to keep your information at hand when visiting archives, libraries, relatives or family history fairs and events. No longer is there the need to be laden down with files and lose papers while researching. The centrally held family tree forms the core of your work with each ‘couple’ having a unique page number – a simple and quick way to find who you need without flicking through the pages. The page for each couple has sections for their names, places of birth, death and burials with ‘tick boxes’ so you can see at a glance if you have a birth, marriage and death certificate for the couple.The marriage information also has a section. Plus spaces to include up to 12 children and their relevant details. The census is the next important fact to be included from 1841 up to the current 1911 census – space is also available for the address and the census reference, which is also a boon when wanting to follow up or print the information at a later date. As well as a notes section at the front of the booklet the back has pages for monumental inscriptions, including such information: where the headstone is, a brief description and most importantly, the wording. 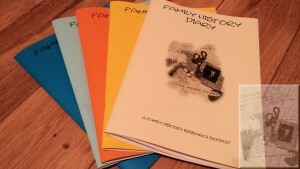 The booklets are in a choice of colours – if using more than one booklet for different sides of the family you can have a specific colour to a family. Now it’s even easier to transfer the newly found information to your main way of storing your family history, be it a computer, database or card system. All in all a good tool for the beginner or more experienced researcher and now includes an extra page for a new family history source. Don’t forget to use a pencil – if you find an error you can simply erase ! Note: there is a variation in the colour choice in this print run but the cost including postage and packing is still only £5.25. This entry was posted in General, News on March 18, 2017 by carol. While walking around Sugar Lane cemetery’s various sections I came across a small and simple headstone. It was not the low headstone in a cemetery that has quite a large number of large ornate headstones that caught my attention. I could quite easily have walked passed and homed in on a stone that looked more interesting and inviting. What was it that made me stop? Well, that is easy to answer. The name on the headstone. Two first names that are quite prolific. A surname that is not unusual. But in amongst the normal names was a name fitting in before the surname. Was it a family name? Was it this person’s mother’s name? Time to see if I can solve this one? Who is J W P Gill? When I reveal the name, you will see why I was drawn to this little stone. James William Phealstead Gill – now you know why he caught my attention! By just looking at four sets of records……………what will there be to find? Born on the 29th of January, 1865, and christened on the 19th of October 1873, John William Phealstead Gill was the son of William Gill and his wife Jane. The Gill family at this time lived in Pincheon Street, just off Kirkgate, Wakefield. William was employed as a tinner. William and his wife, Jane nee Finney, had married in the Wakefield area in the winter of 1862. James Wiliam Pelsead Gill (note change of spelling) of Pincheon Street, Wakefield, aged 25 years old stoker on the railway married Lucy Sandall in St Andrew’s Church, Peterson Road, Wakefield on the 13th of September 1890. The ceremony was performed by A G Whaley, Vicar and witnessed by John Gill and Mary Ann Sanndall (another change of spelling). Both JWP and Lucy’s father by this time had died. In 1901 the couple were living on Newland Street and were the parents to Wilfred aged 9 and Harvey aged 7. Ten years later in 1911, the family are at 12 Newland Street, Sandal, Wakefield, a three-roomed brick terrace house with a small backyard. James and Lucy were now in their 40’s. JWP had now risen through the ranks and was working as a railway engine driver. Wilfred was 19, employed as a railway clerk and Harvey 17 was an engine cleaner. This census also tells that the couple had been married for 20 years and had three children, yes, there was an addition to the family Edith Mary who was now 8 years old. The census form appears to have been written in a different hand to the one who signed the form – could it have been Wilfred, the clerk? If it was, he spelt his father’s name correctly. Life carried on for the Gill family with Wilfred marrying Mary Ann Hall in the Hemsworth Registration District in 1914. The couple is found on the 1939 Register living at 1 Montague Street with a daughter Wilmar Mary who had been born on the 27th of March 1927 – Wilmar later went on to marry Alwyn W Clark in the spring of 1951. Wilfred’s occupation at this time is that of a Railway Telegraph Clerk (unemployed). Harvey in the 1939 Register is working as a Railway Engine Driver living at 170 Agbrigg Road with his wife and family. He had married Hilda R Goldthorpe in the summer of 1918. The family in Register seems to consist of two children, sadly only one is available to view – Nancy, born at the beginning of 1926. Nancy’s entry has had her surname struck through and Jowsey Landess written above. Is this her married surname? The 1939 Register was still being updated with information such as married names for decades. 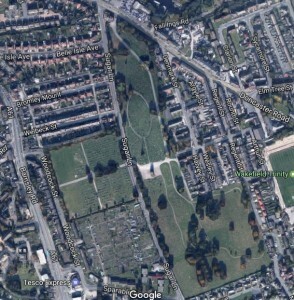 As it happens, Nancy married Arthur Jowsey in the last quarter of 1945 in the Scarborough area according to FreeBMD. That answers the Jowsey question now for the Landess! A Nancy Jowsey married David Landess in the spring of 1956, again in the Scarborough area via FreeBMD. As previously mentioned the 1939 Register was updated with relevant information and in the address column for Nancy are the dates of both her marriages. Firstly the 17th of December 1943 and secondly 18th of May 1956, both these dates fit in with the information from FreeBMD. Did Arthur die? A quick search does not reveal a suitable death for him, did the couple divorce? What happened to JWPG’s youngest child, Edith Mary, well she went on to marry Walter Proctor. The 1939 Register gives the full date of birth information – Edith was born on the 7th of March 1903 and Walter being born on the 25th of January 1905. Home at this time was 239 Dewsbury Road. Walter was a ‘Trained Certificate Assistant Schoolmaster’. A note at the side of his name tells that he was A.R.P. Warden No. 609 – well that is all the number that is visible. By the time James William Phealstead Gill died on the 15th of May 1932 he had seen seen his children marry and seen some grandchildren. Lucy in the 1939 Register is living in Greenwood Road with other members of the Gill family and died in 1943 aged 75 years of age. Have I answered the question raised at the beginning of my research………No. Where the Phealstead in JWP’s name has its origins……..No idea, but if any readers know, don’t forget to tell me. This entry was posted in General on March 5, 2017 by carol.